Enjoy a stay in this historic boutique hotel and wake up to the sounds of exotic wildlife! Set within 15 acres of landscaped gardens in the beautiful Port Lympne Reserve, with stunning views across Romney Marsh and the Kent coast. Our members can choose from 3 room types, with daily breakfast and a two course dinner each night. Within 15 acres of landcaped gardens in the gorgeous Port Lympne Reserve, this hotel boasts wonderful views across the Romney Marsh (8 miles), the Kent coast and also the English Channel! A remarkable array of exotic animals are found here, free to roam as if they were in their natural habitat. 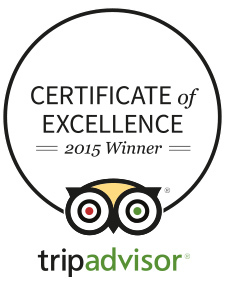 Enjoy a multi-award winning VIP safari experience in England. 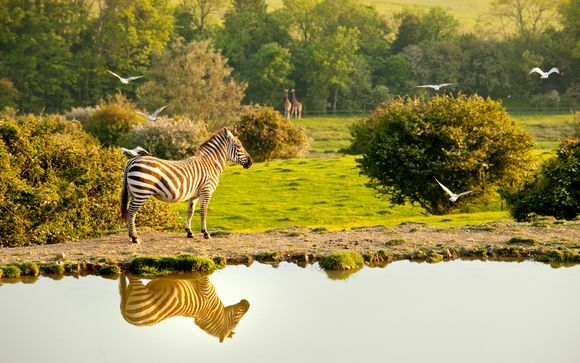 Howletts and Port Lympne Wild Animal Parks are different from conventional zoos, the focus is on providing as natural an environment as possible for the animals in their care, to facilitate successful breeding programmes. The Aspinall Foundation is a charity that relies on support from the general public to fund its back to the wild programme, and vital animal protection projects in Africa, Madagascar and Java, as well as other projects around the world that are protecting some of the world's most endangered species. Enjoy a stay in this grand Edwardian mansion, with a colourful history and its very own wildlife park - the perfect spot for a luxury country break. 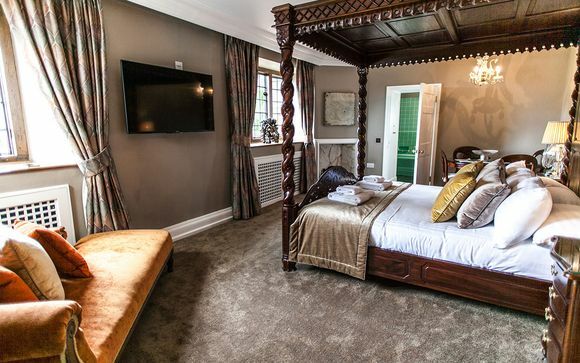 This fantastic boutique hotel was originally built as a weekend and summer home in 1914, whereby its owner hosted the cream of English society, from Winston Churchill to Charlie Chaplin! Recently restored to its former glory, the house is set within stunning gardens and boasts wonderful views of Romney Marsh and the English Channel. The hotel has lovely en-suite boutique rooms, individually designed to an excellent standard - an ideal home away from home! Your may choose from a Classic Double, a Junior Suite or a Suite. The Rex Whistler Room. Central to the mansion, the Rex Whistler Room is located above the entrance with charming views across the unique 'hippo' water feature. 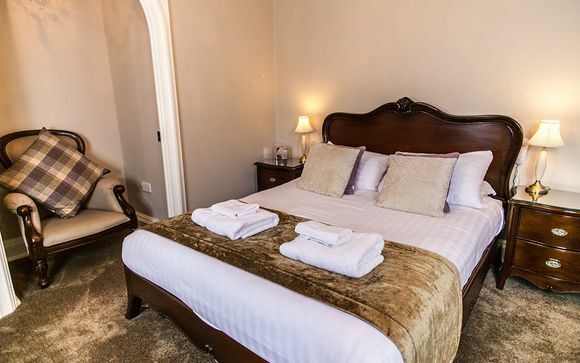 The room has a beautiful blue and yellow colour scheme, with original built in wardrobes and en-suite bathroom; providing a comfortable and tranquil retreat. The room also features a king-size sleigh bed, two relaxing chairs, an occasional table and television. The Sir Herbert Baker Room. This beautiful twin bedroom affords stunning views across the South Terrace and the Romney Marsh out to the English Channel. You can relax and unwind with your own en-suite bathroom and two single sleigh beds. Features include an original 1920s ceiling in the lavishly styled room. The Sir Winston Churchill Room. With a colour scheme inspired by the vibrancy of the Southern Terrace during the summer, The Sir Winston Churchill Room enjoys views across the gardens and grand pond with its high cascading fountain. Enjoy the added luxury of a king size bed and en-suite bathroom. The TE Lawrence Room. Located on the west side of the mansion, this room offers a king size bed and enjoys the last of the evening sun. With a colour scheme inspired by the marble bathroom and the evening autumnal light, the room overlooks the famous Lime Tree Avenue, Trojan Steps and West Terrace. No matter what the weather or time of the year the view from this room is fabulous. Junior Suite. 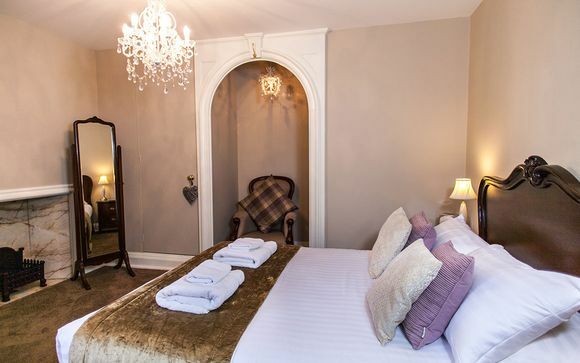 Indulge in a stay in this romantic suite, with a private sitting room, original luxurious marble bathroom and king-size bed. With a colour scheme to compliment the indulgent bathroom and views of the sunrise, you will adore this suite! Suite. The most luxurious of the suites enjoys stunning views all year round of the famous Lime Tree Avenue, Trojan Steps and West Terrace. Indulge in beautiful sunsets and the comfort of a four poster bed, with a private bathroom and your very own dressing room. 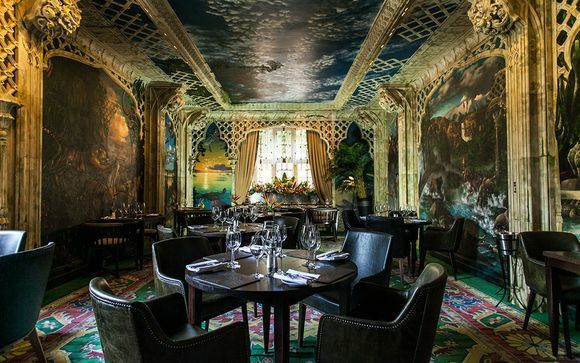 Indulge in this intimate dining venue, where you can dine surrounded by unique animal murals. The restaurant offers an extensive range of fine wines, alongside a delicious a la carte evening menu and lunch menu, designed by Executive Chef Andrew Proctor. Delve into a delicious selection of sandwiches, homemade cakes and pastries, including freshly baked scones, jam and clotted cream. Afternoon tea is the perfect way to relax after a day spent exploring the reserve! Advanced booking is required.